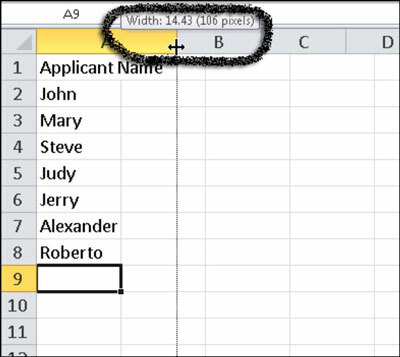 In Excel 2010, you can change any column widths or row heights in your worksheets to improve the readability and appearance of data. For example, if your worksheet contains many numbers, you can widen the columns to make the worksheet less cluttered. You should always widen columns that contain cells with truncated text entries or numbers that Excel shows as ######. Based on the default 11-point Calibri font, the default column width is 8.43 and the default row height is 15. If you change the default font type or size, Excel may also change the standard column width or row height. You can manually set a default column width by choosing Format→Default Width in the Cells group on the Home tab. You cannot manually set a default row height. To manually change the width of columns, position the mouse pointer on the right boundary of a column heading until it turns into a double-sided arrow. Drag left or right until the column is the width that you want. Drag a column boundary to manually change a column width. To set a column width to a specific setting, choose Format→Column Width on the Home tab. 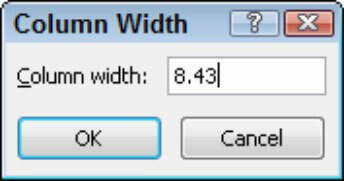 Type the exact width you want in the Column Width dialog box; then click OK.
Set a specific width in the Column Width dialog box. To automatically change the column width so it fits the widest entry, use AutoFit. Double-click the boundary on the right side of the column heading or choose Format→AutoFit Column Width on the Home tab. To manually change the row height, position the mouse pointer on the bottom boundary of the row heading until it turns into a double-sided arrow. Drag until the row is the height that you want. Drag a row boundary to manually change the row height. To set a row height to a specific setting, choose Format→Row Height on the Home tab. 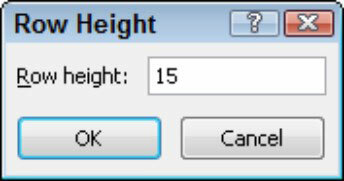 Type the exact height you want in the Row Height dialog box; then click OK.
Use the Row Height dialog box to set a specific height. To automatically change the height of a row so it fits the tallest entry in the row, use AutoFit. Double-click the boundary on the bottom of the row heading or choose Format→AutoFit Row Height on the Home tab.